Atlantic Pump distributes a full line of ANSI/OSHA-compliant nonmetallic pump guards designed by Uniguard. Uniguard Machine Guarding Solutions provide simple and tough solutions to keep workers safe and extend equipment life. Uniguard’s innovative and customizable machine guards are made from sturdy polyethylene. Engineered for easy installation, these machine guards are designed to cover all types of equipment including pumping systems. Uniguard’s rugged, rust-proof machine guards are safer than metal machine guards and are ideal in many settings including severe environments. Whether you need local inventory or support for Uniguard machine guards, Atlantic Pump can meet your needs. Atlantic Pump distributes Uniguard machine guards throughout Maine. Uniguard ANSI Pump Guards are ANSI and OSHA Compliant. These nonmetallic polyethylene guards will not dent or rust, and UV Protected for outdoor use. Cantilevered guard bolts direct to rear of the pump and eliminates drilling base plates to mount guards. ANSI Pump Guards can be installed, removed, or remounted in minutes. Stock ANSI pump guards are available in many sizes, or can be adapted to fit popular pumps through adapter plates. In addition, custom machine guard sizes are also available. UniGuard’s ANSI Barrel Guard is also available with an inspection window as a standard option. 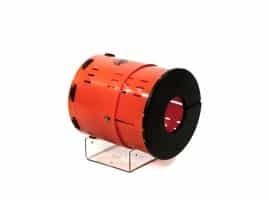 These guards allow visual inspection of the rotating element without removing the guard, and also allow quick, easy, and safe access for lubrication.